NPQ is closely following the Dakota Access Pipeline worldwide solidarity movement. The U.S. Army Corps of Engineers District Commander informed the Standing Rock Sioux tribal leader, Dave Archambault II, by letter last Friday that the federal land north of the Cannonball River will be closed for “safety concerns” beginning on December 5th (ironically, the birthday of Gen. George Armstrong Custer). (On Saturday, November 26th, Archambault responded with a letter of his own.) There are no plans for forcible removal; however, it does not go unnoticed that more than 525 people have already been arrested at the Standing Rock Camp to date. Known also by its hashtag #NoDAPL, the uprising began humbly in the spring of 2016 by LaDonna Brave Bull Allard, a Standing Rock Sioux elder, long before the Dakota Access Pipeline entered the mainstream lexicon. She established a camp along the banks of the Cannonball River as a form of spiritual resistance to the pipeline that is planned to cross beneath the Missouri and Mississippi rivers, as well as part of Lake Oahe, a Missouri River reservoir near the Standing Rock Indian Reservation. On this day, 153 years ago, my great-great-grandmother Nape Hote Win (Mary Big Moccasin) survived the bloodiest conflict between the Sioux Nations and the U.S. Army ever on North Dakota soil. An estimated 300 to 400 of our people were killed in the Inyan Ska (Whitestone) Massacre, far more than at Wounded Knee. But very few know the story. As we struggle for our lives today against the Dakota Access pipeline, I remember her. We cannot forget our stories of survival. While many thousands of people have travelled to join in the protest, this Boston Globe article carefully examines the resistance movement from the point of view of the Native Americans. They are protecting their sacred land. This action involves more of themselves and their ancestors than protesting the construction of the oil pipeline, which they call “the black snake.” With more than 100 Native American nations converging on Standing Rock, this is reportedly the largest gathering of Native people in more than 100 years. As NPQ has noted before, the pipeline corridor was repositioned from its original route north of Bismarck after citizens spoke out against the threat the pipeline posed to their drinking water—a hazard affirmed by the U.S. Army Corps of Engineers. 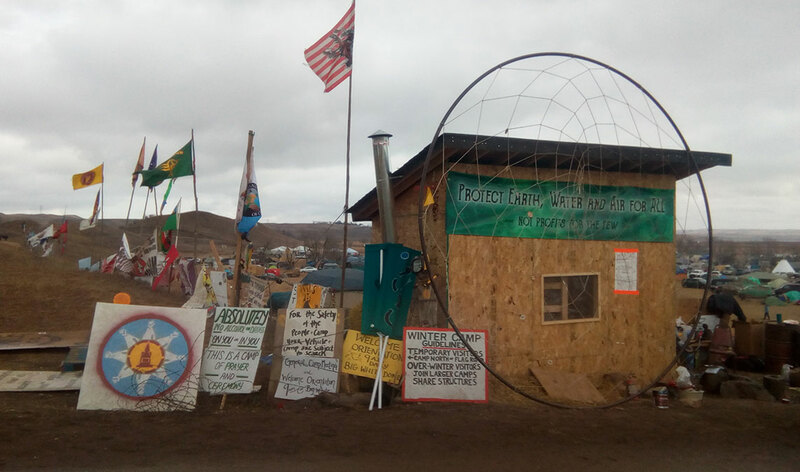 Then, the Corps was accused of failing to fulfill its federal mandate for consultation with the Standing Rock Tribe before signing off on the new route. The Native American protectors’ nonviolent resistance has since been met with private security guards using attack dogs evoking disturbing memories of 1963 Birmingham. The psychological toll can be significant, as well. Fatigue and a lack of tangible progress have left many on edge, occasionally prompting loud confrontations among protesters throughout the camp. Some have left families behind to be here, and these days, said Camp—who has four sons back home—it is not uncommon to walk past tents and hear people crying. The December 5th deadline looms and adds to the rising frustration and tension. Last week, police used water hoses, rubber bullets, and tear gas on some 400 protesters, which left nearly 20 people hospitalized. LaDonna Brave Bull Allard concludes her message in a way that the Globe can only approximate in its earnest attempt to see this movement from the point of view of those who started it and who will have to live for years to come with its aftermath.